This is truly a once-in-a-lifetime trip. 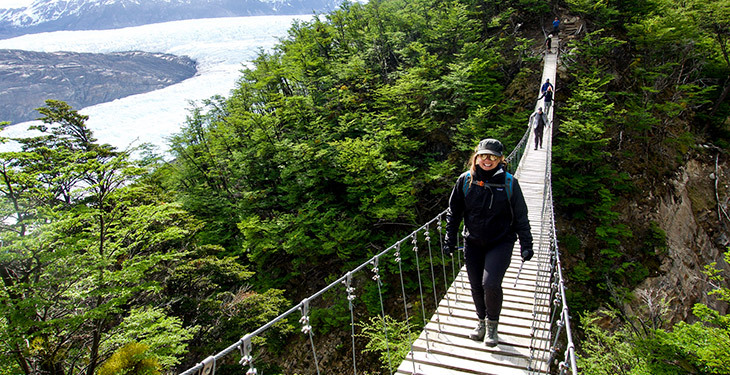 Experience the unparalleled beauty and iconic terrain of Patagonia on this 11-day adventure. 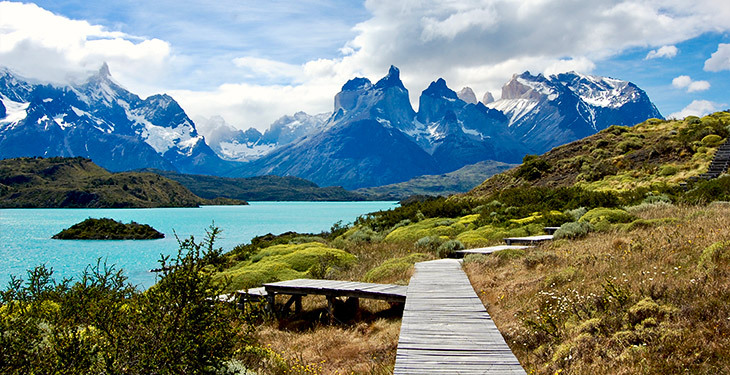 Start your journey in Santiago, fly to Chilean Patagonia, and make your way to Torres del Paine National Park. Spend six glorious days trekking from one refugio to the next while marveling at stunning glaciers, snow-capped peaks, emerald lakes, and old-growth forests. 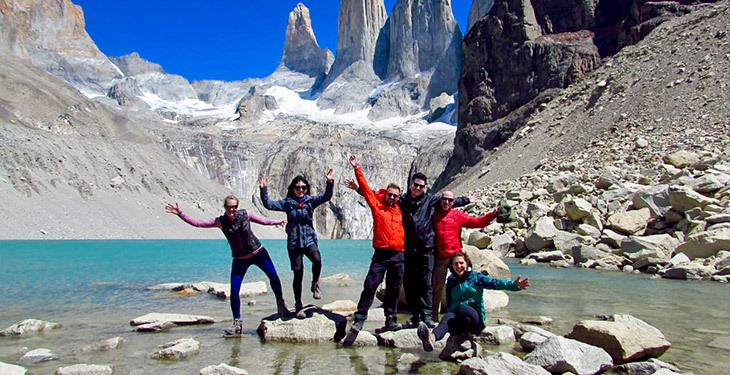 This adventure includes all hotel and refugio accommodations, meals during the trek, your domestic flight (roundtrip) between Santiago and Punta Arenas, expert guide services, trekking permits and entry fees, all ground transportation in Chile, guided excursions in Santiago, and for all participants confirmed 30 days or more prior to their start date, medical/evacuation insurance. Upon your arrival to Santiago International Airport, a OneSeed staff member will be there to greet you and take you to a bed and breakfast, located within walking distance from La Moneda, Chile’s Presidential Palace. Wake up early for a pre-dawn flight to Chilean Patagonia. You'll meet your local trekking guide in Punta Arenas who will accompany you to Puerto Natales (a 3-hour bus ride). On the way to Puerto Natales, soak up the beautiful views of the ocean surrounded by snow-capped peaks. Explore the quaint mountain town of Puerto Natales and spend the night at a local lodge. Start the trek with daypacks as you ascend through a rocky terrain cut by pristine glacial rivers. Climb through a beautiful lenga forest to reach the base of the towers. Another shorter climb will put you feet from the three sister towers and the emerald lake that sits at their base. Return to the mountain lodge for the evening. Spend half of your final day in the park. A three-hour walk toward the lake will take you to the catamaran back to Pehoé and out of the park. Bus transportation will be awaiting your arrival to take the scenic ride back to Puerto Natales. Share a farewell dinner with your guide before a restful night in a partner lodge. Say goodbye to Patagonia! Depart from Santiago International Airport in Chile (SCL) for your flight back home. Went on the Epic Patagonia trip this Dec and the whole experience was amazing!! 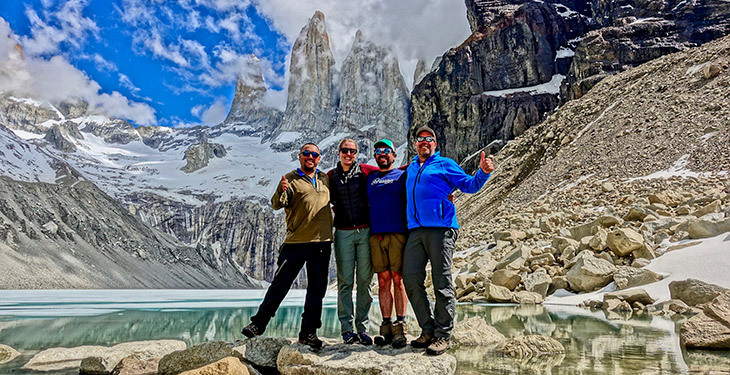 Absolutely stunning scenery, both our Jorge’s ;) (our 2 guides) were so knowledgable, thoughtful, and generous, and every detail of the trip went off seamlessly - highly organized. I went on the Epic Patagonia trip with my whole family and had an absolute blast! OneSeed did an amazing job with all the logisitics involved (and there were a lot - flights, buses, lodging, meals, etc). And our guides (Sergio and Jorge) were the best. All departures are guaranteed! 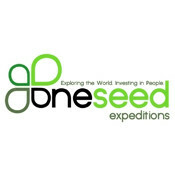 Do not make travel arrangements until you have received confirmation from OneSeed Expeditions. OneSeed guarantees all trip departures, so there is no risk of the trip cancelling due to not enough people signing up for a trip date. However, please do not make travel arrangements until you've received confirmation from OneSeed Expeditions. Fly into Santiago International Airport in Chile (SCL), where you'll be met by a OneSeed staff member and transferred to your hotel for the first night. 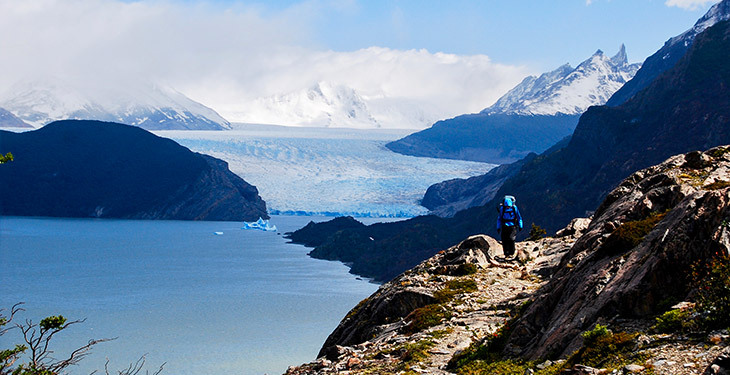 What is the difference between the 11-day Epic Patagonia and the 8-day Patagonia W-Trek? The 11-day Epic Patagonia trip includes transportation and accommodations starting in Santiago, Chile. Whereas, the 8-day Patagonia W-Trek is slightly shorter and start/ends in Puerto Natales, Chile (closest town to Torres del Paine). 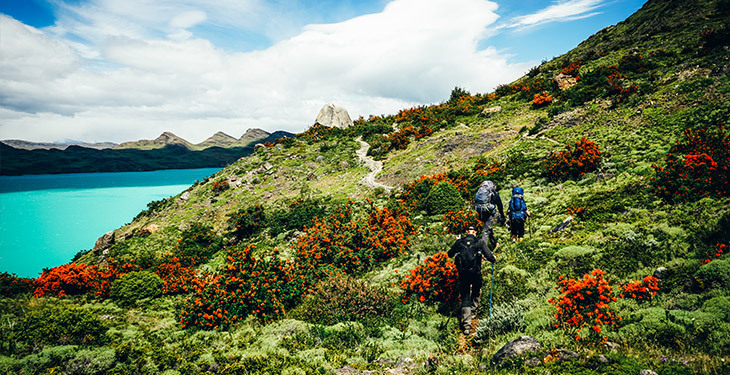 Besides these differences, both treks follow the same route in Torres del Paine National Park and have similar inclusions (meals, accommodations, etc). This adventure has a difficulty rating of intermediate. Expedition difficulty is determined by number of hours walking per day, elevation gain, trail quality, etc. Intermediate adventures require that you are at the least at an average fitness level. Activities will be mandatory and occasionally physically demanding. Experience in this sport is not necessary. This is a great first trek and a perfect fit for people looking for a challenge without daily exhaustion. Typical days (depending on the particular itinerary) range from 3 to 7 hours of trekking. Elevation gain will be gradual and pacing reasonable for people with a bit of hiking experience. Individuals as young as 16 years may attend as long as they are accompanied by a parent or guardian. Otherwise, the minimum age is 18 years old to travel alone. OneSeed maxes out all of their group trips at around 10 people. On average, the Epic Patagonia trips have about 8-9 people, with many being maxed out at 10. Pricing is based on double occupancy (shared rooms) in hotels and refugios, which are mountain lodges scattered throughout the park. Sleeping arrangements are bunk beds in a dorm-style set-up. Bathrooms and showers are shared. Meals are cooked in the refugios and served in the main room (around the stove, where everyone relaxes after their hike). If you are a solo traveler, OneSeed will try to pair you up with another solo traveler of the same gender, but if this is not possible, you'll need to pay a $300 single supplement to OneSeed Expeditions for your own room. Food on the trail is rich in carbohydrates and protein since you'll be burning calories like a champ. Breakfast at the refugios may include eggs, fruit, cereal, lunch meat, cheese, toast, coffee, tea, and juice. Lunch is usually a sandwich made by your guide, fruit, snack bars, and some chocolate. Dinner may include meals like chicken with mashed potatoes, pasta, beef and rice, salad, soup, etc. While extra snacks are not included, you'll have plenty of food during the trek. Travelers also have the option of purchasing snacks at the refugios, so having extra cash on hand is helpful. It is recommended that vegan travelers bring extra protein bars. OneSeed is able to accommodate most allergies and dietary preferences, but please notify them in advance. This can be difficult to estimate since everyone has different spending styles. However, for the 6 days on the trail the only thing you'll need to purchase is snacks and drinks (alcoholic and non-alcoholic). The other 4 days, you may want to allocate money for snacks and drinks (alcoholic and non-alcoholic), souvenirs, tips, etc. $15-$20 per day should be enough to cover additional expenses.